functional limitations: First 5 employees in a company can use Hiri for free, without limitations. Subsequent employees are charged $5 per month. 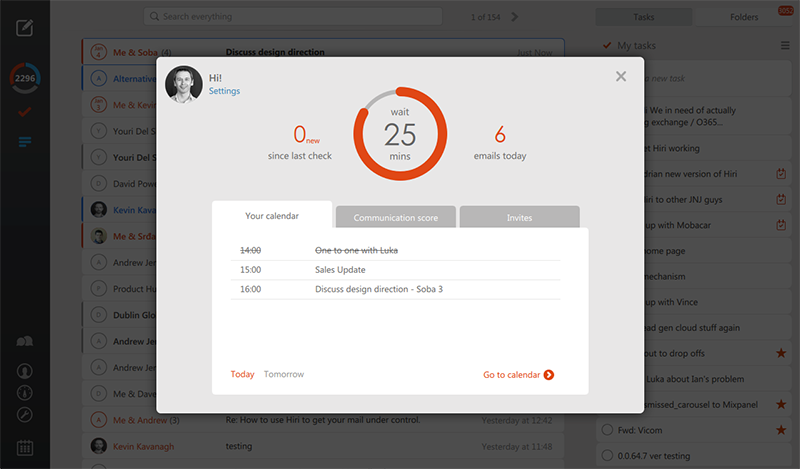 Fast, good looking email client. Lighter than MS Outlook with some unique and clever features. - Uses Microsoft's own protocol - EWS. So if you need to go back to Outlook, everything will be synced. - Great task list built in. You can just drag an email to the right-hand side to make a to-do item out of it. - Triage emails using the Action/FYI filters. - Deal with emails using the 4 D's - Defer, Delete, Delegate and Do. - Nice touch - the subject line is at the bottom of the compose window. You'll write a better subject line AFTER you've written your email. Get your emails noticed. Defrag for Windows (Popularity: ) : Defrag for Windows is an easy-to-use complete defragmenting utility to make your Windows run faster by defragmenting the fragmented files.Defrag for Windows is fully automatic and as user-friendly as a one-button-click.